Mechanical forces play a key role in the shaping of versatile morphologies of thin structures in natural and synthetic systems. The morphology and deformation of thin ribbons, plates and rods and their instabilities are systematically investigated, through both theoretical modeling and table-top experiments. An elasticity theory combining differential geometry and stationarity principles is developed for the spontaneous bending and twisting of ribbons with tunable geometries in presence of mechanical anisotropy. Closed-form predictions are obtained from this theory with no adjustable parameters, and validated with simple, table-top experiments that are in excellent agreement with the theoretical predictions. For large deformation of ribbons and plates, a more general theory is developed to account for mechanical instability (slap-bracelet type) induced by geometric nonlinearity, due to the competition between inhomogeneous bending and mid-plane stretching energy. This comprehensive, reduced parameter model leads to unique predictions about multistability that are validated with a series of table-top experiments. Furthermore, this study has been extended to interpret a different type of snap-through instability that the Venus flytrap has been actively employing to capture insects for millions of years, and the learnt principle is used to guide the design of bio-mimetic flytrap robot. 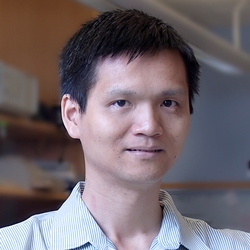 Dr. Zi Chen is currently a Society in Science – Branco Weiss fellow at Washington University in St. Louis, working with Dr. Larry A. Taber on developmental mechanics. Dr. Chen received a BS and MS in Materials Science and Engineering from Shanghai Jiaotong University in 2002 and in 2005 respectively, where he also received a second BS in Computer Technology and Applications in 2003, and his Ph.D. from Department of Mechanical and Aerospace Engineering at Princeton University under Dr. Mikko Haataja and David J. Srolovitz in 2012. He was also a visiting scholar in Dr. Clifford Brangwynne’s group at Princeton University in 2011. His research interests range from computational materials science to biomechanics, covering topics such as dislocation dynamics in materials, phase transformations, and spontaneous deformation of materials at multi-scales.